One of the best aspects of Visio is the ability of shapes to hold data, and the easiest way to do this is to define rows of Shape Data. Each row can be defined as holding one of eight different types, and most of these can have their values formatted for display. In this article I discuss the formatting of these values, using either ShapeSheet functions or automation methods. The driver for this is my on-going frustration with the Microsoft provided standard Shape Data window because of its shortcomings … for example, its lack of multi-line support even though it can hold 64k characters in each row, and its lack of a time control, even though it can store dates and time. I created a simple shape which has at least one example of each type of Shape Data, and applied some sample formatting using the Define Shape Data dialog. I then inserted a table of each row into the shape, and displayed the Type, Label, actual Value, the Format string, and the formatted value (if applicable). If I look at the values in the ShapeSheet of my sample shape, then it is clear that the display in the Shape Data window is slightly different in some cases. Look at the Formatted String and Time rows, for example. txt = "Type" & vbTab & "Label" & vbTab & "Format" & vbTab & "Value"
So, I had to make special consideration for lists and text formatting, and for displaying numbers if there is no formatting. 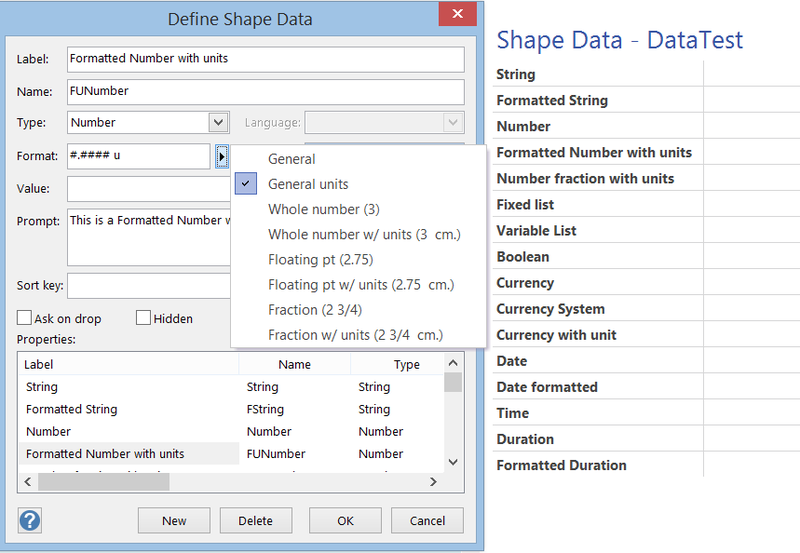 Armed with this knowledge, I can continue to create a replacement Shape Data window add-in in C# and WPF. « Power Map is looking pretty powerful!